Harold Rudd - meherbabatravels jimdo page! Harold & Virginia at Meher Baba's reception at Lonchamps Restaurant in Manhattan on 22nd July,1956. Virginia Rudd chaired the English Department at Rutgers University in New Jersey. She had worked with the well-known scholar of mythology, Joseph Campbell, and was one of the first to develop college-level courses in mythology. Her husband, Harold Rudd, was a professional actor who also served for the time as secretary to the famous film producer, Gabriel Pascal. 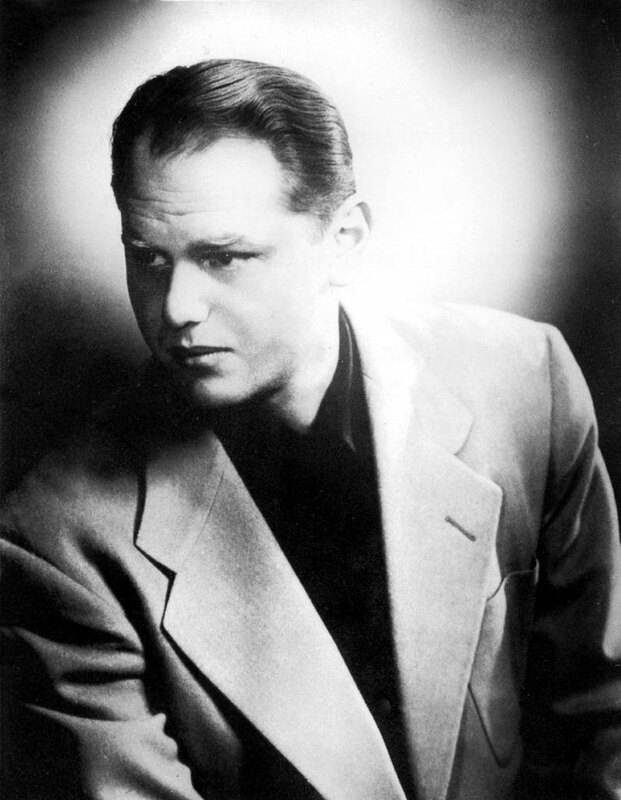 In the years after World War II, Harold Rudd was drawn to meet many international figures who came to the United States representing diverse spiritual and political movements. Virginia often accompanied her husband to these meetings, though she herself had little interest in them. She was especially uninterested in gurus, who were more suspect than political extremists. Finally, she exhausted her patience and announced that she would attend no more meetings. At just this time, Harold learned of a new guru visiting from India. He talked her into seeing this one last figure. He even talked her into traveling all the way to South Carolina, which she considered a foreign country. Virginia had no wish to meet another guru. Her life and interests included no room at all for such a figure. 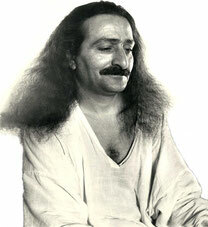 However, as soon as she entered the room to see Meher Baba, she was lost in a golden cloud of bliss that permeated every cell of her being, that answered every question about existence and its purpose, that reverberated through her with such wondrous insistence that she felt she had achieved the goal of life. 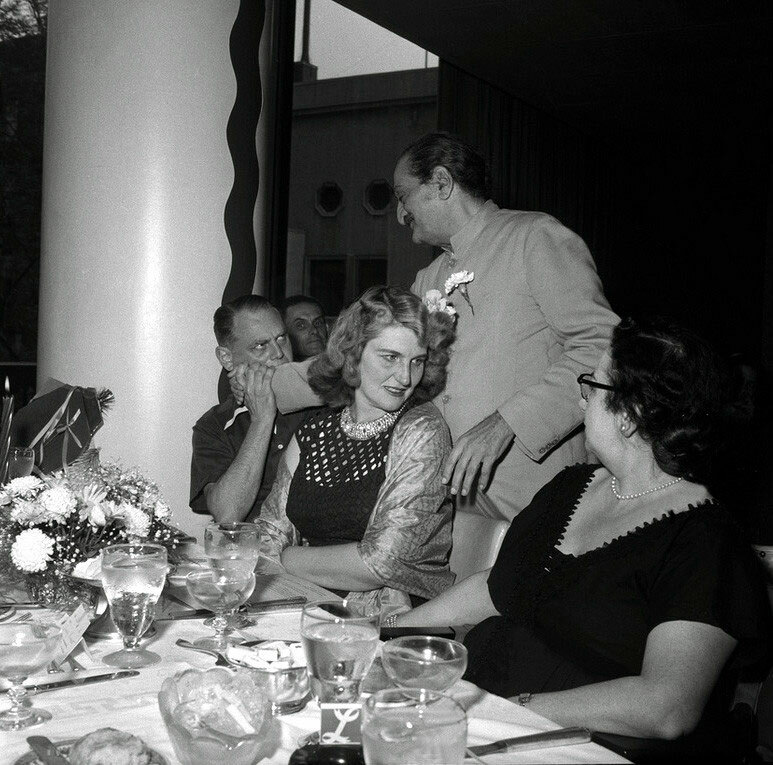 She never even saw Meher Baba sitting there. Later she learned he had put her on his lap and cuddled her, but she has no memory of that. The next thing she knew, she was sitting on a bench behind the barn, several hours later. That was in May, 1952. 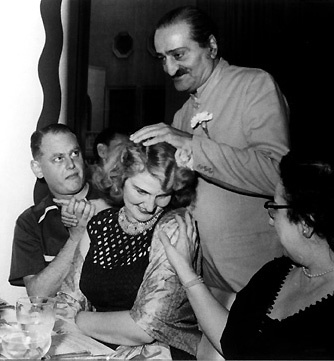 A few months later, Virginia met Meher Baba again, in Murshida Duce's apartment in New York. 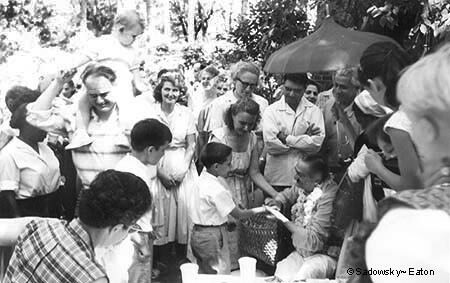 This time she was able to see Meher Baba clearly and converse with him. 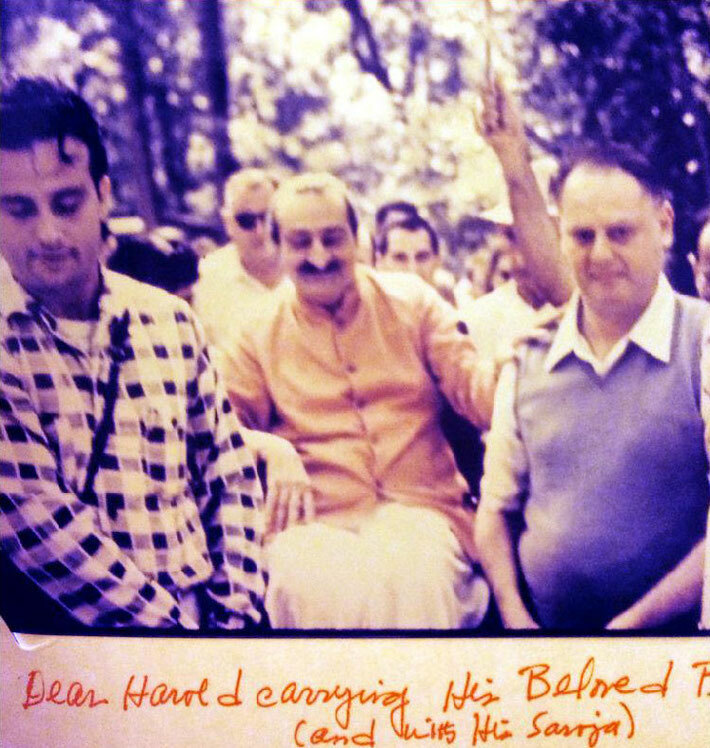 In this photo at Myrtle Beach, Baba is holding Larry Karrasch's hand with Eruch and Adi K looking on. Harold Rudd has his son Raphael on his shoulders with his wife Virginia looking at them. 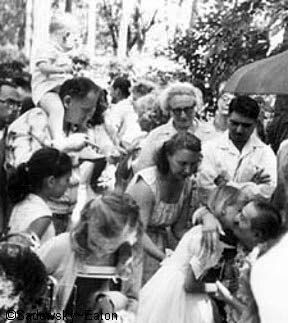 In this photo at Myrtle Beach, Baba is embracing and kissing Wendy Connor with Eruch looking on. Harold has his son Raphael on his shoulders. I traveled from New Jersey by car all night long with my wife, Virginia, to Myrtle Beach. My wife knew nothing or little about Beloved Baba. My meeting with Baba was momentous. I was ushered into the Barn by Delia. As soon as my name was spoken, Baba immediately arose from his comfortable armchair and was waiting for me. I had plenty of preconceived and ignorant notions about a Master and Masters. My background was Theosophy and my belly was full of Masters and the total wreck of my life in following that particular path. So I decided I would look right into the eyes of Beloved Baba and find out for myself if Meher Baba was a Master. As soon as I approached him, he flung his arms around me and the first thing I knew, I was weeping like a child. Baba was most pleased. He spelled on the alphabet board: "Tell him he loves Baba very much." I was quite pleased by this. Then Baba added: "But also tell him that Baba loves him very much." This delighted me even more. Baba discussed certain personal matters with Harold Rudd for a few minutes, and his concluding remark was: "I will see what God has in store for you. When I call you, be ready to leave immediately."